Wrestling legend Mick Foley has had some pretty illustrious tag team partners. Think 'the Texas Rattlesnake' Stone Cold Steve Austin and WWE icon turned movie megastar Dwayne 'The Rock' Johnson. You can now add Sheffield United hotshot Billy Sharp to that famous list. 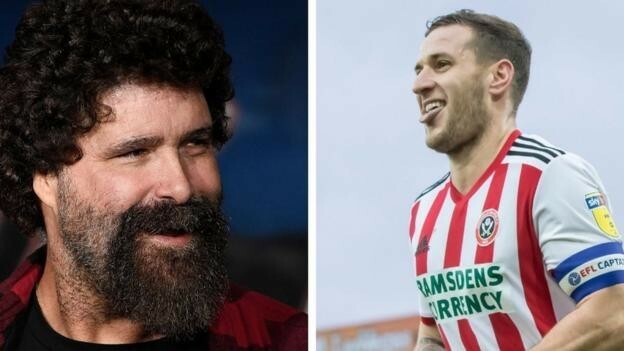 Yep, you've read that right - the pair have hit it off to the extent that the 53-year-old grappling giant is heading to Bramall Lane to watch Sharp's Blades attempt to lay the smackdown on Brentford next month. The unlikely friendship began in January when Sharp unveiled his 'Mr Socko' celebration - a tribute to three-time WWE champion Foley's finishing move - after scoring in United's 2-2 draw with Norwich City. The Blades' top scorer pulled a sock from his shorts and delivered the 'Mandible Claw' submission hold to team-mate George Baldock. Foley - who wrestled under several aliases including Cactus Jack, Dude Love and Mankind - tweeted his approval of the celebration, leading Sharp and the Blades to invite him to be their guest for Brentford's visit to Yorkshire on Tuesday, 12 March. He has accepted, and Bramall Lane will also host an 'Audience with Mick Foley' night the following evening. Foley said: "Exciting news, I am taking up Billy Sharp on his offer to be his guest at the Sheffield United game on 12 March and on the next day I have a show of my own right there at the stadium!" Now retired, Foley was one of the most popular wrestlers in WWE history, aided by his somewhat unconventional use of a sock puppet down his opponent's gullet as a cartoonish finishing move. Foley has enjoyed just as much success outside the squared circle, writing several autobiographies and memoirs - the first of which topped the New York Times' bestseller list for several weeks - as well as a series of children's stories and also embarking on a stand-up career.